Floral prints are extremely popular, as they are associated with warm and nice summer weather, reminding of a lot of fun, our children are having outdoors. Cute baby shortie by Dolce & Gabbana with dominating yellow and green colors is one of the best options for warm summer day. Cotton and jersey short sleeved t-shirts are constantly in trend for summer weather, one of them is presented here by BOSS. Bubble print on the front would for sure be adored by your baby girl. Press buttons fastening on the back is an advantage. Bright dresses are the best options for summer time activities of your baby girls. Those with cute prints would for sure attract attention of your small princesses, like for example the dress by Catimini, made like a set of a top and a skirt with lovely cat on the front. All children like drawing, the prints, which look like children’s drawings always look cool on their clothing, like on the short sleeved t-shirt by Paul Smith Junior. On the white background – there are sun and moon. The t-shirt is made of soft cotton jersey and has additional press buttons on the shoulder. The weather might be unstable even during summer; often in the evening there is a need to put on something warmer than a usual t-shirt. Pale yellow bolero cardigan by Monnalisa Bebe could be the best solution. Frilled edges would add charm to the whole outfit. A cute t-shirt by Chloe would be a perfect addition to any girls’ wardrobe. The tender print on the front reminds of nice time at the sea side, the palm seems to be painted just over the t-shirt, the metallic gold dots – are additional decorations. 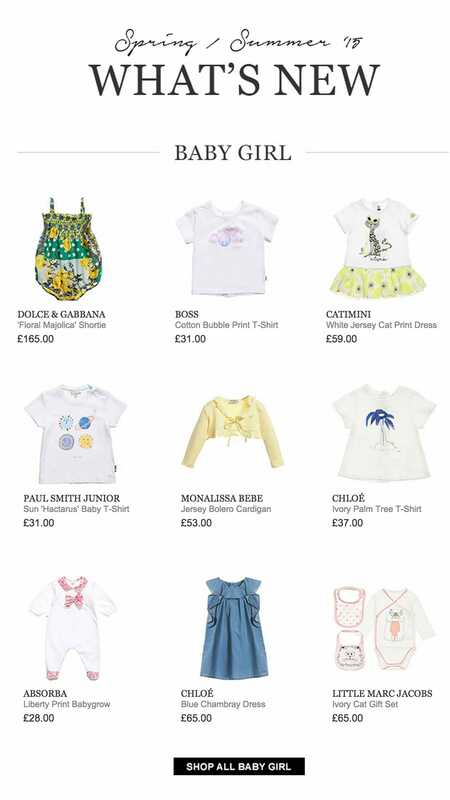 Babygrows are without any doubts really comfortable for children under one year. The babygrow with feet by Absorba looks cute and lovely due to combination of white color with contrasting floral print fabrics on the collar, feet and bow on the front. The press buttons on the back part and between legs make the processes of dressing and diapers change easy and quick. Denim fabrics never lose their popularity, however they are often too thick for summer time, thus there is a great option – soft cotton with the look of lightweight denim, like for example by the dress from Chloe. The simple design is compensated with ruffles over the neck line and sleeve holes. If you are looking for a cool and functional present for a baby girl, then pay attention to the set presented by Little Marc Jacobs, consisting of a long sleeved bodyvest and two bibs. Made of soft cotton jersey – all the parts of this set would be comfortable to wear and easy to wash.